Canada could be set to make Olympic history in Sochi, becoming the first country to twice improve on a total medal performance after hosting the Games. That happened after the 1988 Winter Olympics in Calgary, with Canada's medal haul going from five there to seven four years later in Albertville, and it could happen again this year, as several sets of predictions have Canadians continuing the streak of improvement at every Winter Olympics since 1984 and bringing home more than the Canadian-record 26 medals won in 2010. How is that likely, as Canada won't have home-field advantage any more, or the massive corporate backing that came with it? Well, new events are expected to play a key role, as is the surprising amount of funding Canadian athletes were able to keep. First, there are the commonly-cited predictions from Dutch group Infostrada Sports, which use data from the World Cup circuits, world championships and previous Olympics to forecast medals in each sport. The full, interactive version of their latest rankings (updated Tuesday) can be found here with a complete breakdown of each medal Canada's expected to win, but you can get a look at their overall medal table in the screenshot at right. According to that prediction, Canada's expected to finish with 33 total medals, the second-highest number behind only Norway's 36 and a substantial improvement from 2010. However, Canada would notch only 11 golds in these predictions, a drop from the Olympic-record 14 collected in 2010 and third in these 2014 projections behind Norway and the United States. Still, 33 medals would be a very impressive haul, and it's a step up from the 31 Infostrada forecasted for Canada in January. Individual Canadians Infostrada expects to shine include speed skaters Charles Hamelin (two projected golds, including the 5000-metre relay, and two projected silvers) and Christine Nesbitt (projected for three silvers, counting the team pursuit). “Our performance objectives are pretty clear: we want to win more medals than we won in Vancouver,” says Merklinger, 55, the former national team swimmer and elite-level curler from Ottawa who succeeded Alex Baumann as Own the Podium’s CEO two years ago. 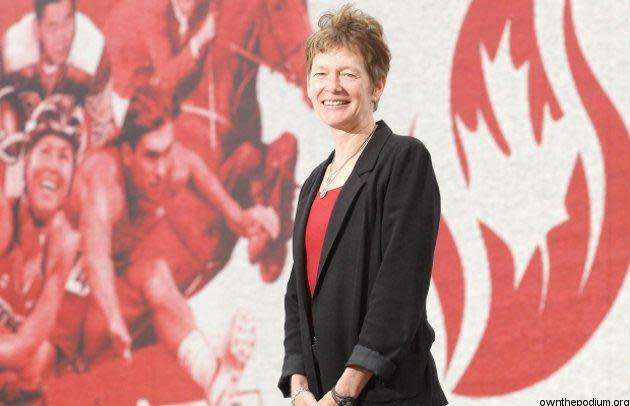 “We want to win more medals at the Games subsequent to Vancouver than we did in Vancouver — we did that following the Calgary Olympics, and no nation has ever done it twice in the Games after they hosted. So, it looks like Canada has an excellent chance of at least hitting Own The Podium's goals, and perhaps doing even more. The Associated Press has Canada with 31 medals, 13 of which are gold, while American journalist Beau Dure's SportsMyriad projections also give Canada 31 medals (with a 10-10-11 gold-silver-bronze split). The Wall Street Journal's simulation-based approach is slightly less favourable, but only slightly so, giving Canada nine golds and 30 medals overall. Those are impressive predictions, especially considering that Canada no longer has home-field advantage. What's leading to so much projected success? Well, new events are a key component. 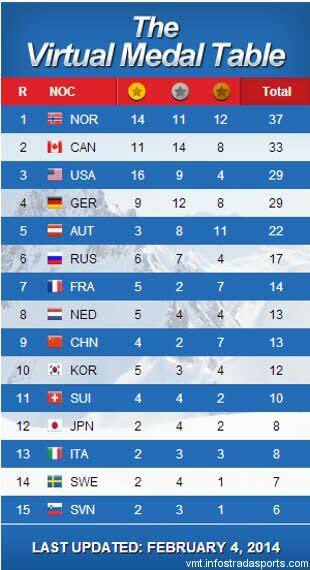 Canada has historically done well in new Olympic events, and that trend looks to continue in Sochi. There are 12 new medal events slated for these Games (mixed relay biathlon, mixed figure skating team, mixed luge team relay, men's and women's halfpipe skiing, men's and women's slopestyle skiing, men's and women's slopestyle snowboarding, men's and women's parallel giant slalom snowboarding and women's ski jumping), and Infostrada currently predicts Canada will pick up eight medals there (two in men's slopestyle snowboarding, two in women's slopestyle skiing, one in women's slopestyle snowboarding, one in women's halfpipe skiing, one in team figure skating and one in luge team relay). In some cases, the Canadian projected success in new sports is thanks to already having top athletes in what's just become an Olympic discipline: for example, slopestyle snowboarder Mark McMorris has dominated the event at the X Games, and he and Max Parrot should both be set for greatness in Sochi, especially with Shaun White pulling out of the event. In other cases, these new events are adding a team component to disciplines where Canada already has some of the top competitors, such as figure skating and luge. Both aspects work out for the red and white, and should boost the Canadian medal totals. “That was really the part that scared me the most,” admitted [Canadian Olympic Committee CEO Marcel] Aubut. “Just imagine: you had the Olympics at home, best Winter Games ever, and all of a sudden you have to renew those guys. There is usually an incredible recession after a Games at home. “Athens, for instance. Greece went from 68 to three sponsors (after 2004). Same thing with Calgary, from 36 to 4, they all left to do something else because it’s so cash-intensive. But we knew that. “First of all, the success of the (2010) Games really helped us, but secondly, we really attacked that right away to make sure that they stayed in the team. The private-donor end happened through B2ten and more recently the Canadian Olympic foundation. “I can tell you that there’s $14 million more being invested into the Sochi quadrennial than was invested into Vancouver, for direct national sport organization (NSO) support,” Merklinger said. That persistence in funding is a key reason why Canadian athletes are still succeeding on the world stage, and why they're expected to do so well in Sochi. Of course, projections aren't everything, and the recent run of severe injuries to top Canadian athletes might help to derail these predictions. Plenty can go wrong, too, especially in chaotic sports like speed skating; Canada's expected to do well there, led by Hamelin and Nesbitt, but anything can happen. Still, there should be numerous athletes clad in red and white on the podiums in Sochi, and this could turn out to be a very rewarding Olympics for Canada.